9 White Deer has released a range of coeliac-friendly craft beers. IRISH CRAFT BREWERY 9 White Deer has launched five gluten-free craft beers and could use the range as a springboard to become a completely coeliac-friendly brewery. The company was founded in 2012 by publican Don O’Leary and former marine engineer Gordon Lucey and is based out of the Muscraí gaeltacht in Ballyvourney, County Cork. The new range from the brewery will add five beers to the company’s line-up and includes a red ale, a pale ale, an IPA, a German-style kölsch and a stout. The release of this new range has come after the company dipped its toe in the gluten-free beer market with the launch of Stag Saor last year. “Saor started off as an ale and in early 2016 we brought it over to a more lager-style beer,” Lucey told Fora. He added that the potential in the gluten-free sector could lead the company away from its traditional offering. “I think these new gluten-free beers will overtake the others we already have in our range,” he said. Over 40,000 people suffer from coeliac disease in Ireland – a condition that causes an intolerance to gluten. 9 White Deer co-founder O’Leary has been diagnosed with the condition and Lucey said this has shaped the direction of the company. “There is no choice out there for people who can’t have gluten. Some companies have one beer, but that’s not a choice,” he said. 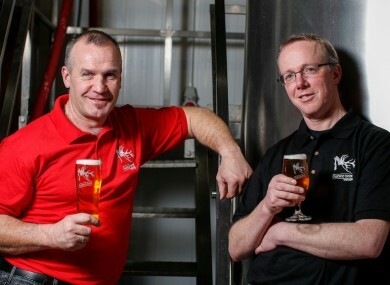 9 White Deer employs nine people at its brewery in the Muscraí gaeltacht. Since 2012, roughly half a million euro has been pumped into the company through bank loans and West Cork Development Partnership to both produce the beers and also renovate its premises. The company has also installed a packaging facility at the brewery, which it has used to both package its own beers and beers from five other microbreweries. It took roughly six months to develop the first beer of this new range, which has to meet EU regulations of less than 20ppm of gluten to be certified as gluten-free. Lucey said once they had developed the first in the range, the other beers were easier to perfect. 9 White Deer has planned to release a number of speciality craft beers throughout the rest of this year, according to Lucey. These new beers will be once-off brews and also produced to meet gluten-free standards. Email “This Irish brewery is toying with the idea of going completely gluten-free”. Feedback on “This Irish brewery is toying with the idea of going completely gluten-free”.